The most complete and authoritative idioms dictionary available, the Cambridge Dictionary of American Idioms gives you the tools to understand contemporary American English. It gives clear, easy-to-understand definitions and more than 1,000 usage notes that explain what idioms mean and how they are used today. With dozens of entertaining illustrations and more than 8,000 example sentences taken from the Cambridge International Corpus, it shows how idioms are really used. The Subject Index helps learners find idioms related to health, money, feelings, truth, and many more topics, and the Study Section groups idioms to make them easier to learn. If you want to understand American English idioms, this is the book that will spell it out for you.  Corpus based - includes idioms really used today, and gives examples based on authentic spoken and written material.  Thesaurus index - allows lookup by meaning, so you can find idioms about health, money, anger, happiness, work, etc.  Defining vocabulary - clear, concise definitions written using a 2000-word vocabulary learners already know. Easy-to-understand definitions make meanings clear. More than 1,000 usage notes explain how to use idioms. 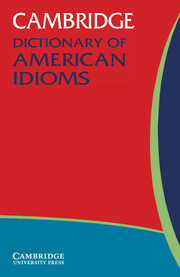 Up-to-date coverage describes current American English idioms. Thousands of example sentences show how idioms are typically used. A Subject Index and Study Pages make learning idioms easy. 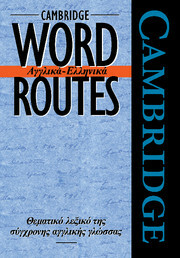 The bilingual reference book that helps learners use the right word in the right place.